Months ago I visited my best pal who relocated to Birmingham and tried 2/3 different beers by Tiny Rebel Brewing. From that moment on I was hooked on Tiny Rebel Brewing and Cwtch. Since then I’ve tried to find it various pubs and bottle shops across the UK. I’ve failed every time. However, recently Beer52 asked me to trial their beer delivery service. There are several companies doing craft beer “subscription” services and I’ve heard bad things from each one. However, Beer52 is excellent and for £24 a month you get 8 different amazing craft beers a month. I’m probably bias but because Beer52 included Cwtch in my box I am a huge advocate of them and their service. 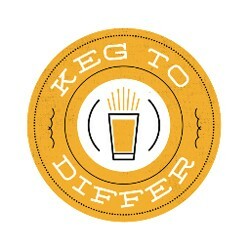 Using KEGTODIFFER10 you’ll get £10 off a monthly Beer52 subscription, so go do it! Cwtch is a Welsh Red Ale. So think Meantime Yakima Red and Five Points Hook Island Red. If ever there is a red ale on offer I tend to go for it. For me, it is like a mixture of a lovely pale ale and a dark porter, just somewhere in the middle! Cwtch has a real red glow to it and has a strong hoppy aroma. Six malts, two US hops and “weeks of Tiny Rebel love and attention go into making this unique beer.” That’s a quote from the site and sums up my feelings towards to it. Cwtch in Welsh means cuddle and I can’t think of a better word for an incredibly reliable, enjoyable and satisfying experience. Just like a cuddle. This a sweet smelling, bitter tasting red ale that is one of the most reliable ales around. Da Iawn Tiny Rebel.